Tonight felt like a pasta night. Why? Because…I love pasta. Gluten-free pasta, that is. And it had honestly been ages since I had made pasta for my roomie and I. With Friday fast approaching, I have bin ingredients that are screaming to be used. So…I went on the hunt for some ideas. Friends, I say this to you honestly…DO NOT FEAR PASTA! It can be made healthy as long as you don’t drown it in creamy sauces, oils, or have portion distortion. It’s all about moderation and preparation. And, thanks to a recipe from one of my favorite Clean Eating sites, I had just the recipe to modify tonight. The original recipe was already gluten-free…but I changed out ingredients for what I had in my crisper drawer from my CSA bin. It worked out beautifully. 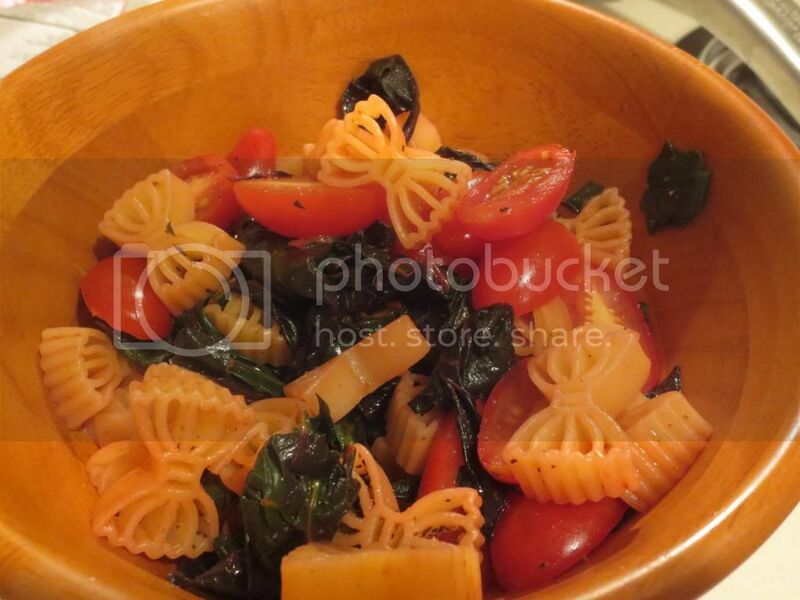 The original recipe was taken from The Healthy Apple, who put up a great sounding dish called Swiss Chard Lemon Pasta. Well, I had rainbow chard. I hate olives, but I had grape tomatoes. I always have lemon and lemon zest on hand…it seemed ideal. And tonight…this healthy pasta dish was dinner. And, wow…did the flavors ever sing. Cook the gluten-free pasta according to package directions. Remove from heat; drain and set aside. Meanwhile, in a large skillet, cook rainbow chard in olive oil over medium heat until wilted, approximately 4 minutes. Remove from heat and transfer to a large serving bowl. Add cooked pasta, tomatoes (or olives), cilantro (if using), scallions, vinegar, lemon juice, lemon zest, smoked paprika, sea salt and pepper; gently toss to combine. Don’t be fooled into thinking that this pasta will be lacking without a sauce. With the lemon and the apple cider vinegar, it’s flavortown! Honestly. Just lots of flavor, and it all plays well with the pasta and the vegetables. I was delightfully happy when I sat down with my bowl of veggies with a little pasta. I love it when a dish is more vegetables than anything else. Not only was this dish delicious…it was easy to prepare and simple to make. Just a little chopping, some action on the stove…and then…viola! Dinner is served. A healthy pasta dish…you better believe it’s possible. Don’t just take my word for it, though. Try it for yourself. You know you’re dying to. Pasta night…starts…now! This entry was posted in Clean Eating, Entree, Food, Gluten-Free, Italian, Local, Mediterranean, Pasta, Recipe, Vegan, Vegetables, Vegetarian by The Celiathlete. Bookmark the permalink. This sounds like my kind of pasta! Thanks for sharing! I might try this tonight! I already have all the ingredients! 🙂 Haha!